Opera Australia has just staged the Massenet Opera Don Quichotte in Melbourne. Fascinating. It starts rather weakly, but gets better and better. It is really a vehicle for a bass (Chaliapin in the original) and we had Furlanetto, surely among the greatest basses at present on stage. He was superlative, as a singer and actor, conveying vulnerability, nobility etc. Has anyone else seen this opera and have a view on it? That opera is always put on for a star bass, and I guess Furlanetto qualifies these days. New York City Opera (not the Met) produced it in 1986 for one of its most celebrated alumni, Samuel Ramey. I'd completely forgotten it. So just now I reminded myself by playing Chaliapin's recording of Quixote's death scene, in which he sings both the Don and Sancho. Even a great singing actor can't disguise the thinness of Massenet's music, but with a strong cast it may pass muster on the stage. From what you say, it appears to have done so in Melbourne. I agree with JohnF here: I have the CD set pictured below with Teresa Berganza and Jose Van Dam, truly luxury casting, led by Michel Plasson. The weakness of Massenet's music is quite evident. Perhaps on stage it works better. I've heard the Plasson with Van Damrecording and the earlier one conducted by Kazimierz Kord conducting on Decca and with Ghiaurov and Crsspin but haven't seen a staged production yet . I would certainly like to and the Met should definitely revive it . It's a beautiful opera and John, I would''t call Massenet's music "thin " by any means . Massenet is a composer of more substance than many are willing to admit and Manon is by no means the only good opera he wrote . Some critics have cynically called Manon typical of his music and that if you've heard this opera, you've heard everything by him , but they are dead wrong . > Massenet is a composer of more substance than many are willing to admit and Manon is by no means the only good opera he wrote . My view, hearing the music for the first time, was not so much that the music was weak but uneven. The opening scene is very slight, Spanish=themed ballet music, but the middle scene is powerful, and the cello solo before Act V is quite stunning. A couple of duets are quite memorable. But in the end it is not a great opera. 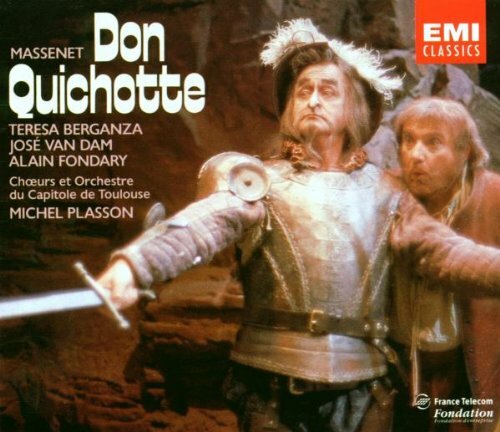 As John said, it relies enormously on the bass singing Don Quichotte. If he is great, as I thought Furlanetto was (he's also my favourite Philip in Don Carlos), that covers a multitude of sins. If he is not, nothing could redeem the whole.